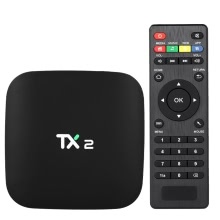 TX2 Smart Android TV Box is your great choice and can change your traditional TV & LCD monitor into a multimedia center by connecting the Internet (Via WiFi or RJ45). With this product, you can greatly enjoy videos, music, photos, games and more. This smart Android TV Box will bring you much fun and convenience. Featured with the Android 6.0 system, powered by high-performance RK3229 Quad-Core CPU, TX2 is a HD media player with a Penta-core GPU. You can easy access to thousands of movies, photos, music and more for your entertainment. This mainstream processor comes with 1GB RAM, 16GB EMMC Flash ultimately delivering a richer using experience which makes home entertainment become easy. Up to 32GB expandable storage offers more space to enjoy movie, music, etc. H.265 decoding occupies less bandwidth (about 50%) than H.264; H.265 and VP9 support decoding most file formats at present, enjoying 4K movie smoothly which is 4 times of full HD 1080P. Supports IEEE 802.11b/g/n 2.4GHz WiFi and 10 / 100M LAN, it can provide reliable network. Also supports OSD kind of languages: English, French, German, Spanish, Italian, etc. 24 languages. Note 2: The remote controller of the product belongs to attached and functional accessory. If part of product functions can&apos;t be controlled by the controller, please purchase external mouse or air mouse to operate. You will have a better using experience. Medium: Local Media playback, support HDD, U Disk, TF card. Decoder Format: 4K, HD MPEG1/2/4, H.265, HD AVC/VC-1, RM/RMVB, Xvid/DivX3/4/5/6, RealVideo8/9/10. Video Format: Avi, Rm, Rmvb, Ts, Vob, Mkv, Mov, ISO, wmv, asf, flv, dat, mpg, mpeg. Audio Format: MP3, WMA, AAC, WAV, OGG, AC3, DDP, TrueHD, DTS, DTS, HD, FLAC, APE. Picture Format: HD JPEG, BMP, GIF, PNG, TIFF.